VascuLife® VEGF-Mv (containing Vascular Endothelial Growth Factor) is a medium optimized for the culture of Human Microvascular Endothelial Cells. VascuLife® supports the rapid proliferation of these cells in a 5% serum environment. 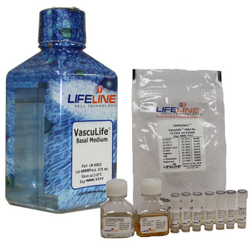 VascuLife® VEGF-Mv Medium grows Human Dermal Microvascular Endothelial Cells and other Human Microvascular Endothelial Cells at rates that meet or exceed other commercially available serum-containing media while maintaining excellent cell morphology.